Bali offers not just various customs but also various "adrenalin pump" parks. Many exciting amusements are available in Bali, with something new opening all time. The number of offshore and inland attraction are on the rise because many tourists want them. After white water rafting that has gained popularity in Bali, comes offshore rafting or ocean rafting. The more adventurous sort of amusement has now become an alternative sport for tourists. Just try it. Your heart will beat faster, especially when your boat hits two meter-high waves at high speed but even so, just like any other adventure sport, safety is the first priority. 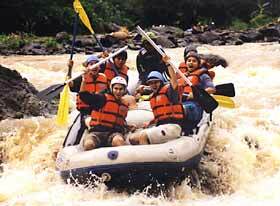 Meanwhile white water rafting is still a popular activity with trips on the Ayung, Telaga Waja, Unda rivers, etc. You can refresh your mind by watching beautiful scenery along the route. If you do not want to push your heart so hard, paradigling is a good choice and an exciting way to see Bali from the air. If wind conditions are right, you can view Bali from a very different perspective. If you are a beginner, a professional instructor will accompany you to ride in tandem. So, there is nothing to worry about. For people with strong confidence and no heart problems, a must is bungy jumping and slingshot. Slingshot will shoot you up skyward so you can feel like a bullet. Bungy jumping offers you a chance to take the plunge. You can choose your view, wanna Kuta's view (in Kuta) or natural waterfal's view in Gianyar. For your entire family, Waterbom Park is an excellent day out for adult and children. It offers five different water slides and a lazy river. You can relax by the pool that has underwater music and swim-to bar. If you want to experience "war in paradise" Fantasy Bali Splat Mas-Jungle Skirmish is the place for you. It is a war game, where the point is to capture your opposing team's flag and kill the enemy with paintballs.